Since this site was established in 2000, I have been fortunate to have been interviewed for stories in several different publications, served as Bears radio reporter for Pro Football Central, and have appeared on television. If you're in the media and are looking for colorful, informed opinions on Chicago Bears History that come from a FAN, contact me. See below for links to media featuring Bearshistory.com and the author. The author of BearsHistory.com is available to speak to your group about the Chicago Bears. The website and our Chicago Bears Bar profiled on Comcast SportsNet's Chicago Huddle. Click the photo to watch. 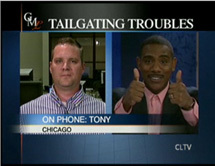 I appeared on CLTV's Garrard McClendon Live on August 6, 2008 to discuss the Bears' new policy preventing tailgating during games. Click the photo for a link to the clips. I participated in CBS 2's morning news show outside frigid Soldier Field on January 19th with Randy Salerno, Ed Curran, Zach Zaidman and my buddies from 3dollarcooler.org. Great time. On January 18th, I was asked to appear on WGN's Morning News to discuss the site and the Bears' NFC Championship hopes. The segment was awesome, and I thank Robin, Larry and their staff for having me on. Click the photo for the video clip. Click the photo for a 15 mb download of my appearance with the famous (infamous?) Bruce Wolf of various Chicago media outlets. I was surprised by this call from a Fox producer asking me to appear in the morning two days from then to promote my book. Had the opportunity in 2002 to be filmed for The History Channel's special on the history of tailgating in 2002. That year a great producer piled in the van and rode with us to Green Bay to tailgate before that Bears loss. The Chicago fans were only featured for 90 seconds, but we were on up front, which was very cool. WGN Radio Season Opener Interview-Interview prior to 2012 season opener with WGN's JC Corcoran, September 9, 2012. WGN Chicago Interview-Interview prior to 2010 NFC Championship game with WGN's Nick Digilio, January 22, 2011. KIRO Seattle Interview-Interview to discuss 2010 Divisional Playoff matchup on Northwest Nights January 14, 2011. Sports with Richard Cross Interview-Interview to discuss 2010 Divisional Playoff matchup on Sports Talk with Richard Cross, January 13, 2011. Final Score Radio Interview February 2007 Thanks to Matt Levine who invited me on his show The Final Score on the eve of the Super Bowl. The show aired on WSTC 1400/WNLK 1350 in New Haven, CT. Click the link to listen to the interview. The guys at Outside the Loop Radio did a nice interview with me on February 1st. Click the link to listen. NPR's Only a Game December 2007 NPR's Only a Game asked me to contribute to a piece on great blowouts in history. Click the link to listen. Bears-Rams 2003 Report Report from 2003 prior to Bears-Rams meeting. Bears-Rams Report Followup Follow up comments from the hosts following my report. Bears-Lions 2003 Report Report prior to Bears-Lions game. Preview 2004 Live Interview Interviewed live on Pro Football Central previewing the 2004 Bears, May 2004. "History Buff: It's rare for Bears, Packers to be good at same time" by Christopher Placek for Daily Herald, January 22, 2011. "Welcome to Beartopia" by Mike Hines for Chicago Tribune RedEye Edition, September 14, 2007. The BearsHistory Bar featured in Chicago Tribune's RedEye Edition. Click the image to the left for the photos and article. "Da Bears Fans Hit the Road" by Tom Weir of USA Today, September 9 2002. Tom rode with us on our early-morning trip to Champaign for the Bears' opener that year. He flew in from him home in Tennessee the night before, stayed in a hotel near my house, and he and the photographer (Todd Buchanan, see the link to his work on my links page) met our roadtrip group at my house. On the 2 1/2 hour drive to Champaign, he interviewed me and my friend Brian Grabowski (yes, that's his real name) for the article. "Grossman polarizes Bear fans" by Wayne Drehs of espn.com, January 11, 2007. Wayne Drehs of espn.com contacted me to contribute to his piece on Rex Grossman entering the 2007 playoffs. This is a great article that documents how strange it's been to watch seemingly the best and worst quarterback the Bears have had in 20 years. "Fan Goes from Grandstand to Bookstand" by Robert Sanchez of theDaily Herald, January 2, 2005. Illinois Institute of Technology did a better job promoting my book than anyone else, and this story was prompted by a press release they sent out. "Plainfield Native Pens Chicago Bears Book" by Shannon McCarthy of the Plainfield Enterprise, December 1, 2004. Article written by the paper in the town in which I grew up. "You Too, Can Dress Like Da Coach, My Friend" by Robert Sanchez of the Daily Herald, May 27, 2005. Robert asked me for a quote for a story he was working on when Mike Ditka released a line of tropical shirts in 2005. "Da Senator Would've Been Fun" by Dave Wilson of the Joliet Herald News, 2004. My friend Dave Wilson imagines Da Coach as Illinois Senator. Arizona Republic Article-Doug Haller of the Arizona Republic asked me a few questions about the 1985 Bears in this article prior to Super Bowl 42. Just too bad the 2007 Bears weren't in attendance at the Super Bowl, as was expected of them. Chicago Bears History, by Roy Taylor 2004: Click the graphic to learn more about the book I wrote in 2004. Bear Memories: The Chicago-Green Bay Rivalry, by Beth Gorr 2005: Beth is a staff reporter for the Bear Report who I've gotten to know over the last couple years. She has just completed this book on the Bear-Packer rivalry. I contributed a chapter to the book. Click the image to go to Amazon.com for more details or to purchase it. 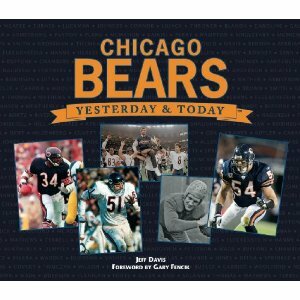 The Chicago Bears: Yesterday & Today, by Jeff Davis 2009: Jeff, who I'm thankful to call a friend, did a great job on this pictorial story of Bears History. I also proofread this book prior to its release. Click the image to purchase a great work. The Tailgater's Cookbook, by David Joachim 2005: David adds to his list of successful books, which include "A Man, A Can, A Plan, and others with the best tailgating cookbook I have seen. I shared some insight with him on tailgating at Solider Field. I don't think my comments were even used in the book, but I'm cited in it anyway. Click the image to go to Amazon.com for more information or to purchase it. I repeat: it's the best tailgating recipe book I have seen.